Analysis Technology | Sanoh Industrial Co., Ltd.
CAE Analysis* is an indispensable technology used for product development, especially these days when “Design by Analysis” is the mainstream design method. 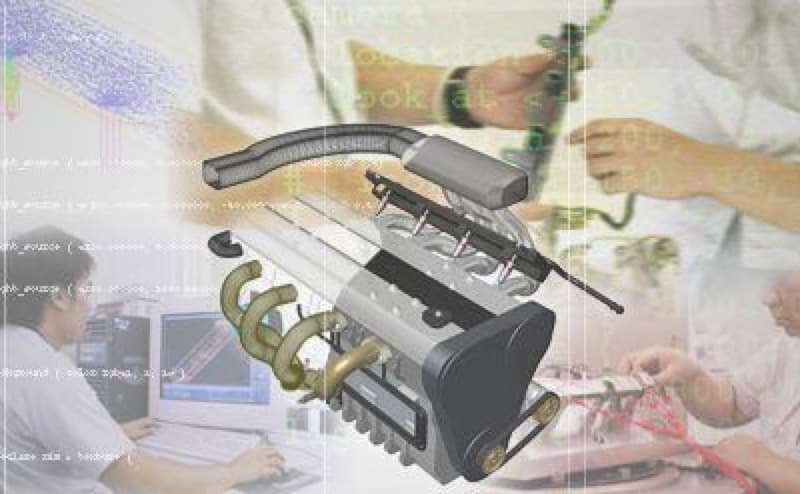 Sanoh utilizes CAE analysis for various purposes, including the development of new products and technology, the evaluation of newly launched products prior to trial manufacture, the investigation of the causes of defects, and so on. This process has helped Sanoh to successfully shorten the development period, improve quality, and reduce costs. This analysis technology with design capabilities is one of Sanoh’s many competitive strengths. We have always continued to strive to introduce new technology. Our technical services are highly valued by our customers for the utilization of analysis technology and our responses reflecting their various needs. * CAE (Computer Aided Engineering) Analysis: Numerical analysis and simulation using computer technology. The analyses of the results (illustrated as pictorial images and graphs, obtained by inputting set values and conditions such as design) allow identification of problems and verification without repeated trial manufactures. Fluid analysis is a technology used to analyze how liquid or gas flows through an object by displaying the velocity and the quantity of the flow. Sanoh is able to optimally and quickly perform design by analyzing the difference in the ventilation resistance (the ease of liquid or gas flow) and in the pressure drop (the loss or reduction of pressure) of objects with different capacities or shapes. This is an example of the comparative analysis of an L-shape FIR and a square-shape FIR, whose shapes and capacities are different. Seeking a way to reduce emission gas and improve the efficiency of fuel distribution inside the FIR to the injectors, changes in the fuel flow velocity and pressure, and flow directions were analyzed. The small arrows in the figure indicate the fuel velocity and direction in the FIR when the engine starts. This analysis confirmed that there are two systems of fuel flow inside the L-shape FIR; one that runs above the injection cups and another that runs through the downward protruding portion of the FIR. It was also confirmed that the protruded portion has a surge tank effect (absorption effect of the fuel pulsation). In addition, it was discovered that the flow velocity inside the L-shape FIR is slower than that of the square-shape FIR. That means that the L-shape FIR helps to reduce fuel pressure fluctuation. In other words, it reduces emission gas. This is an example of analyzing whether there are any problems with the flow through the quick connector if the shape is changed. The distribution of flow velocity and pressure, and flow direction were analyzed both before and after the shape change. The small arrows in the figure indicate the fluid velocity and direction in the quick connector. These figures show that there is no change in flow velocity on the outlet side even after the shape change. Therefore, there is no problem in changing the shape. Vibration analysis is a technology used to analyze what type of stress is put on an object being subjected to vibration. It also analyzes the level of vibration frequency that will cause the object to resonate, and with what level of acceleration. 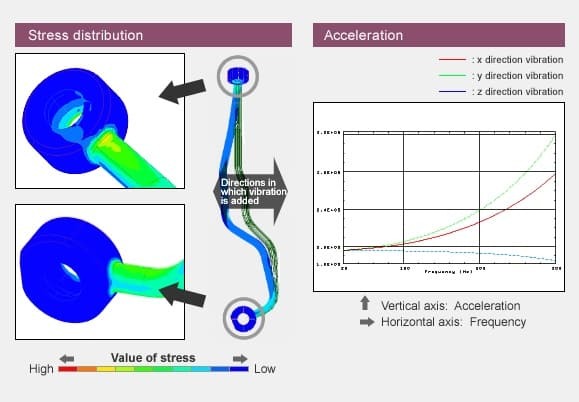 Sanoh is able to optimally and quickly perform design by analyzing such points as what type of stress and what level of acceleration objects attached to the engine are subjected to while the engine is running. This is an example of the analysis of an L-shape FIR for a four-cylinder engine. 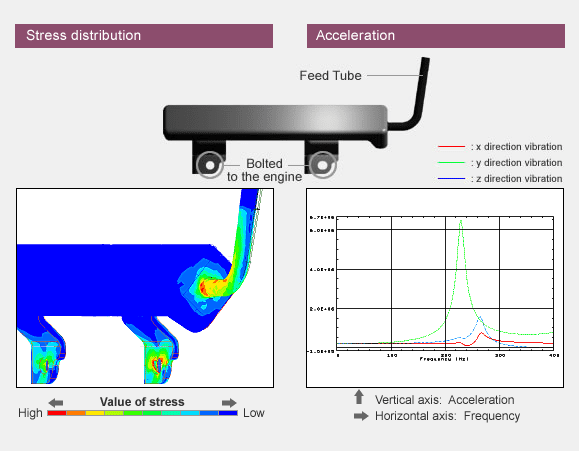 Stress and acceleration of the feed tube of an FIR attached to an engine were analyzed as research to prevent fracturing and other damage to the FIR caused by engine vibration. The above right graph indicates the measured resonance frequency and acceleration at the feed tube portion when vibrations from three directions, X, Y, and Z, were generated under the condition that the FIR’s stays are bolted. The horizontal axis of the graph indicates the frequency, and the vertical axis indicates the acceleration. This graph shows that there is a resonance at around 230 Hz in the Y direction, which is recognized from the peak of the graph, and that the acceleration in the Y direction is higher than those in other directions. The above left image indicates the measured stress caused by vibration at 230 Hz in the Y direction, which causes higher acceleration than those in other directions. It can be seen that greater stress occurs at the base of the feed tube than at other areas because the feed tube is swung by the vibration. However, the strength of the stress is within a tolerable range, and therefore, it is confirmed that this vibration is not problematic to the FIR as a product. * Oil tube is a tubular product that is attached to the engine. This is an example of the analysis of an oil tube. Stress and acceleration of an oil tube attached to an engine were analyzed as research to prevent fracturing and other damage to the FIR caused by engine vibration. The above right graph indicates the measured resonance frequency and acceleration at the most displaced part when vibrations in three directions, X, Y, and Z, were generated under the condition that the both ends of the oil tube are bolted. The horizontal axis of the graph indicates the frequency, and the vertical axis indicates the acceleration. This graph shows that although the acceleration in the Y direction is the highest among the three directions, there was no resonance (the peak of the graph) at any frequency within the measured range in any directions. The above left image indicates the measured stress caused by vibration at 230 Hz in the Y direction, which causes higher acceleration than those in other directions. It can be seen that greater stress occurs at the base of the oil tube than at other areas because the oil tube is swung by the vibration. However, the strength of the stress is within the tolerable range, and therefore, it is confirmed that this vibration is not problematic to the oil tube as a product. Structure analysis is a technology used to quantitatively analyze displacement (strain and change of the shape position) and stress in order to examine how an object changes structurally while it is being subjected to stress. Sanoh is able to optimally and quickly perform design by analyzing what functional differences are caused by the differences in product shape and structure. This is an example of comparative analysis of five types of FIR with the same capacity, but different shapes. FIR performance requirements have become increasingly high recently due to design changes to the FIR, including the elimination of the fuel return system and pulsation damper. In particular, it is known that the pulsation (the fuel pressure fluctuation) generated when the injectors emit a jet of fuel leads to the dispersion of the fuel quantity emitted to the engine, which further causes lower fuel efficiency and an increase in emission gas. In our company, we have focused attention on the deflection of the FIR as a solution to reduce pulsation inside the FIR, and analyzed whether a difference in FIR shape creates a difference in the ease of deflection. The above images show the displacement distribution of various FIRs at the cross section caused by pressure generated when fuel flows through the FIR. These animations demonstrate that there are differences in deflection depending on the FIR shape, and that the L-shape FIR and the reverse L-shape FIR are more easily deflected than the other three shapes. It has been found that FIRs with the L-shape and the reverse L-shape absorb more pulsation generated when fuel is emitted than those with other shapes. – A study of stress levels when a load is applied. This is an example of the analysis of an L-shape FIR for a four-cylinder engine. The stress was analyzed as research to prevent deformation and fracturing caused by the external pressure added when a rubber hose is attached to the feed tube of the FIR. The above right image illustrates the stress distribution when load equivalent to that generated when a rubber hose is inserted into the end of the feed tube is applied. This shows that greater stress is generated at the base of the feed tube than at other areas. The strength of the stress, however, is within the tolerable range, and therefore, it was confirmed that this FIR has sufficient strength as a product.